The Burguieres Gallery where Ally displays her artwork. Art is alive in the French Quarter. You can buy it in the galleries or on the streets. There is artwork everywhere. New Orleans is an artist’s dream because inspiration is all around you! I remember 13 years ago when I stumbled across George Rodrigue* and his Blue Dog. I’m still kicking myself for not purchasing that painting! Needless to say, Mr. Rodrigue’s artwork is beyond my budget; however, I did discover another working artist: Ally Burguieres. I don’t know what I like more: the fact that she works at her gallery or that she earned a Ph.D. No matter. Anyone visiting New Orleans must stop in her gallery at 736 Royal Street. Ally and her mom Janice run the gallery along with an adorable dog, Cocoa. 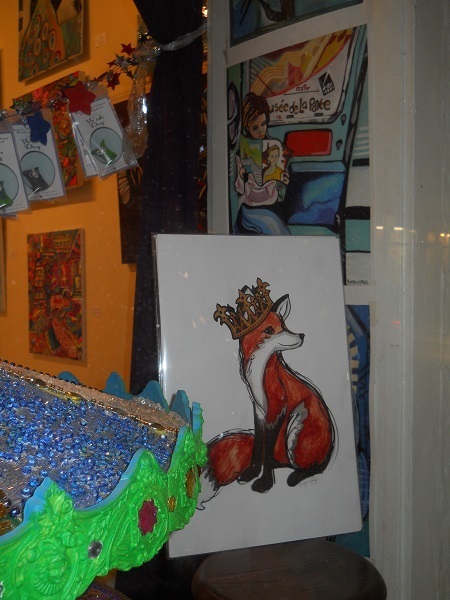 The gallery is as whimsical as Ally’s artwork. Further, Ally is also an inventor. 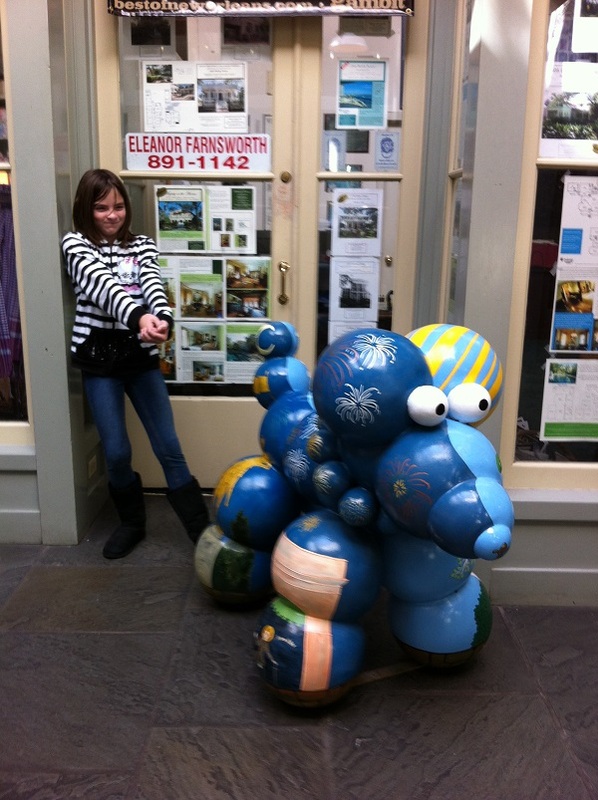 She created the “Wish Dog,” “a small hand-made trinket that burns wishes with a trendy smoke-blowing effect.” Visit the Garden District to view her Bead Dog. Don’t let the implied simplistic nature of Ally’s art fool you. She’s got a lot of talent. Peruse her online gallery to see the depth of her work. Visit http://www.galleryburguieres.com/ to learn more about Ally. * Mr. Rodrigue died shortly after my visit to New Orleans. 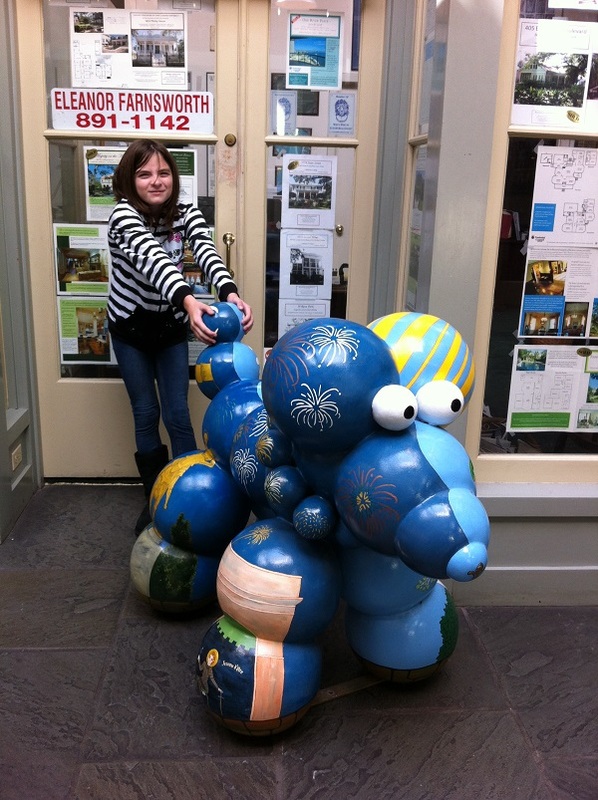 The Bead Dog Ally painted is on display in the Garden District. Bella “walking” her Bead Dog.